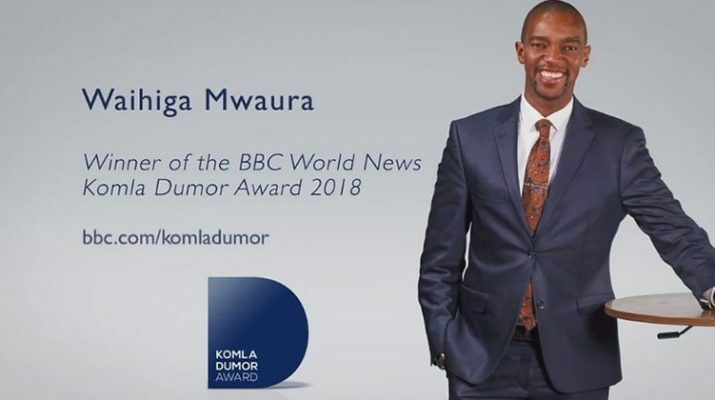 Kenyan Waihiga Mwaura wins BBC World News Komla Dumor award – Kenyatta University TV (KUTV). All Rights Reserved. A Kenyan journalist and TV presenter has won this year’s BBC World News Komla Dumor Award. Waihiga Mwaura presents Kenya’s most-watched evening news bulletin on Citizen TV. As part of the prize, he will spend three months at the BBC in London and travel back to the continent to report on a story there. Mr Mwaura is the fourth winner of the award, after Ugandan Nancy Kacungira won the inaugural prize in 2015, followed by Nigerians Didi Akinyelure and Amina Yuguda. He is a well-known journalist and a respected face across Kenya, who covers a wide array of topics from sports to politics. “Komla Dumor meant a lot of things to me as a journalist and as an individual,” he said. “If I can only achieve just 10 or 20% of what he did, I feel like I would have made my contribution to journalism. He impressed the panel with his story-telling ability and on-screen presence. His passion for giving Africans a voice and his investigative journalism set him ahead of other entrants, the panel said.